The advantages of living in an old house . . . .
My house was built in 1950. The closets are miniscule. Seriously, they’re about a hanger width deep, and less than an arms width wide. I have storage under the bed, boxes randomly placed, and all kinds of things pigeon holed throughout the house to try and find storage. 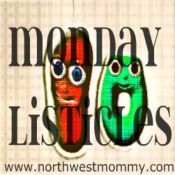 So this week’s Monday Listicles is going to be an interesting exercise as I try to list 10 things in my closet–that aren’t clothes! We’re going to have to go around the house . . . .
My bedroom closet: a Johnny Jump Up. When my best friend was pregnant with her first, she lived in an apartment that didn’t have molding around the doorways. I think her oldest could have spent three days straight in this thing. He loved it. (Image not mine, pulled from Amazon page). Someone gave me this, and it has been loaned out, returned, and well used over the last three years. Living Room left: a dresser full of yarn. Seriously, it’s a problem. Back bedroom: regifting shelf. Don’t lie. You have one too somewhere. Bath item sets, picture frames, etc. Back bedroom: baby shower decorations. All closets: Miscellaneous collection of dog hair and dust that has drifted in on hardwood floors. Molly Maids I am NOT. ← Last new Linkup, I promise! It’s Sunday Social! You are so clever to have a regifting shelf. But you must have a system, right? Otherwise what if you gave someone something back that they gave you once? That would be terrible. Once I regifted something to my mother-in-law and then she turned around and regifted it someone else on the spot, right in front of my face!! 🙂 I was glad it was a regift in the first place, so I didn’t mind. We have a regifting shelf in the garage. Sounds like you have a lot of space to stash stuff. So is belly dancing like all other activities: you end up with many pairs of shoes or in your case skirts for it? I have more than my fair shair of extra dog hair around here too. I swear I don’t know how they have any hair left! A whole dresser full of yarn – wow! Then again, I’m not a knitter. Maybe that’s what you need. I think regifting is a good thing as long as the item is in new condition and you don’t accidentally give it back to the person who gave it to you! Dogs and hardwood floors are horrible! I have hairballs hiding everywhere.